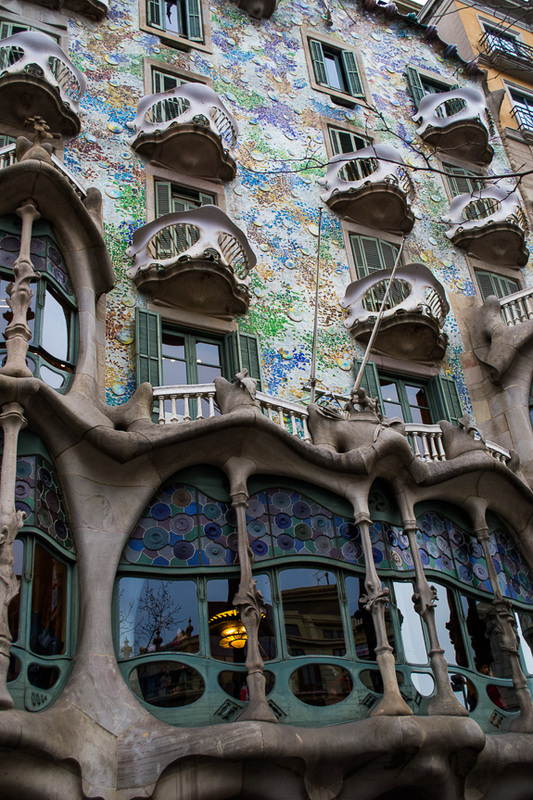 Casa Batlló aka “the building that looks like bones”… sadly we didn’t get to go inside. 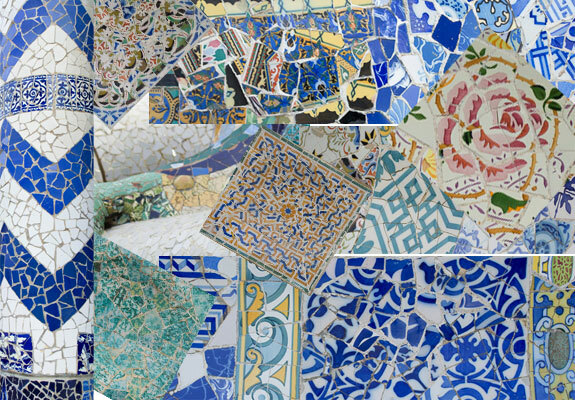 We were absolutely delighted by what we discovered in Barcelona. 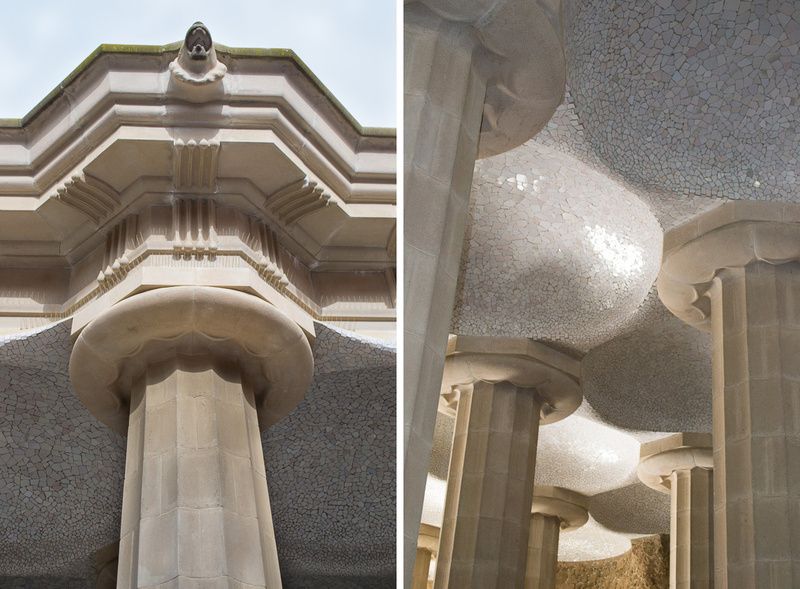 Gaudí’s style and influence is unmistakable throughout the city. 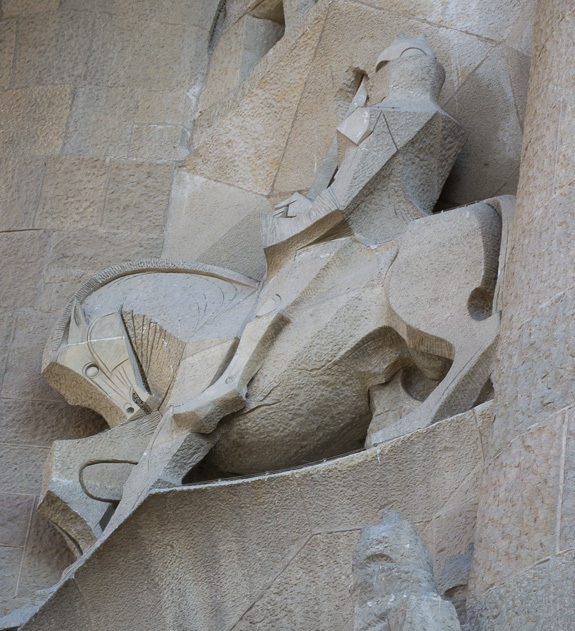 Did you know that his works in Barcelona are actually a UNESCO World Heritage Site? All the colors and shapes are just stunning and our photos really don’t do them justice. You absolutely must go and see it for yourself! 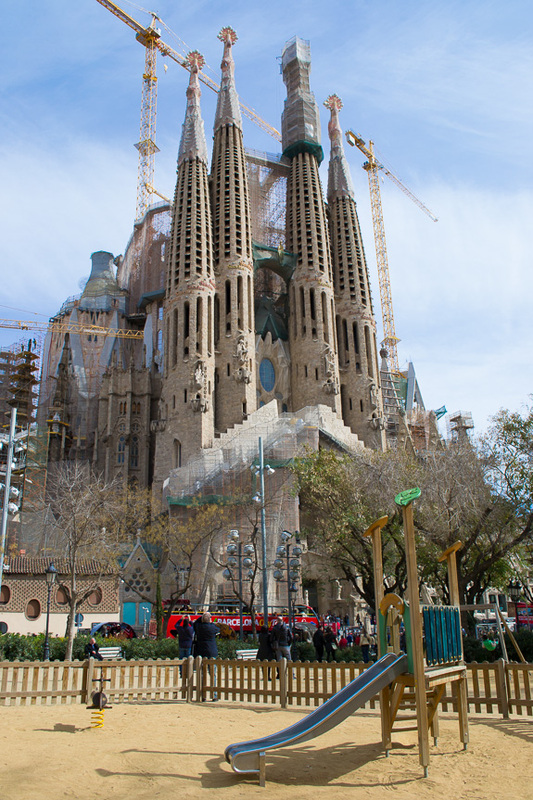 We had intended to visit La Sagrada Familia on our first day in Barcelona but the line to go inside the church was huge and we have an impatient toddler. 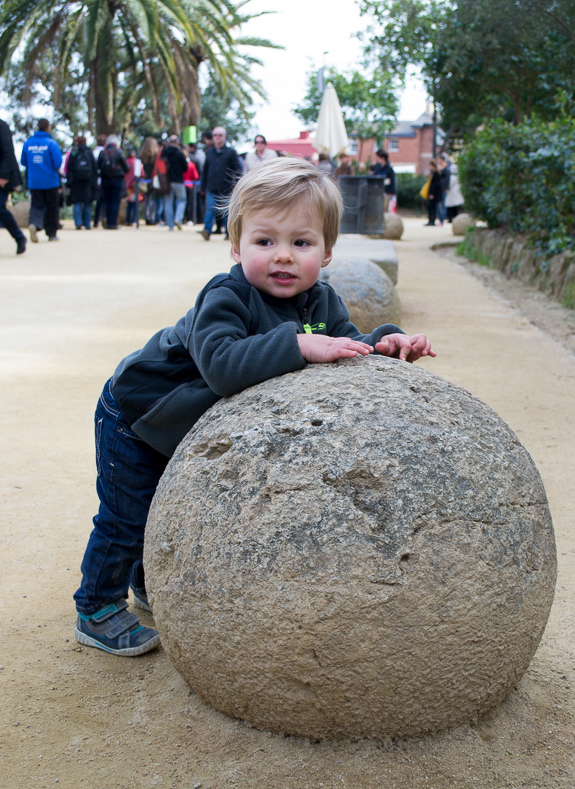 So we admired the exterior and enjoyed the fantastic playground (I love kid friendly cities) across the street! 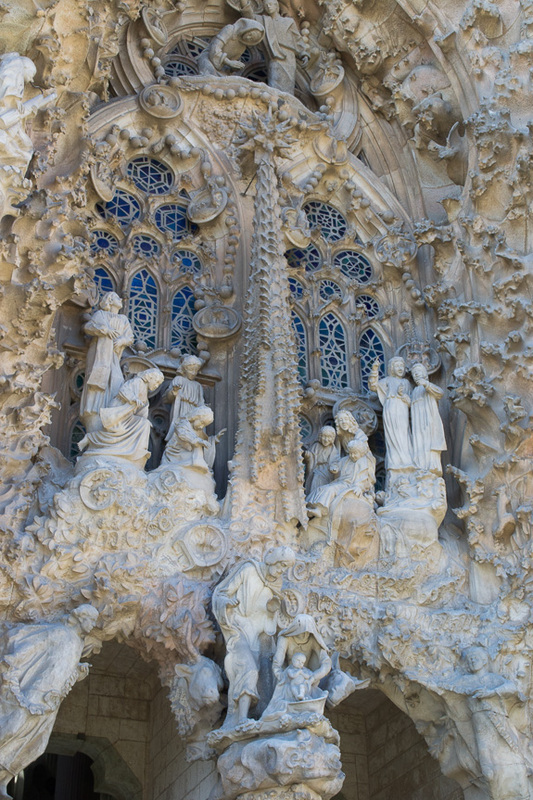 You might be surprised to learn that La Sagrada Familia is not a cathedral. It’s actually a basilica. 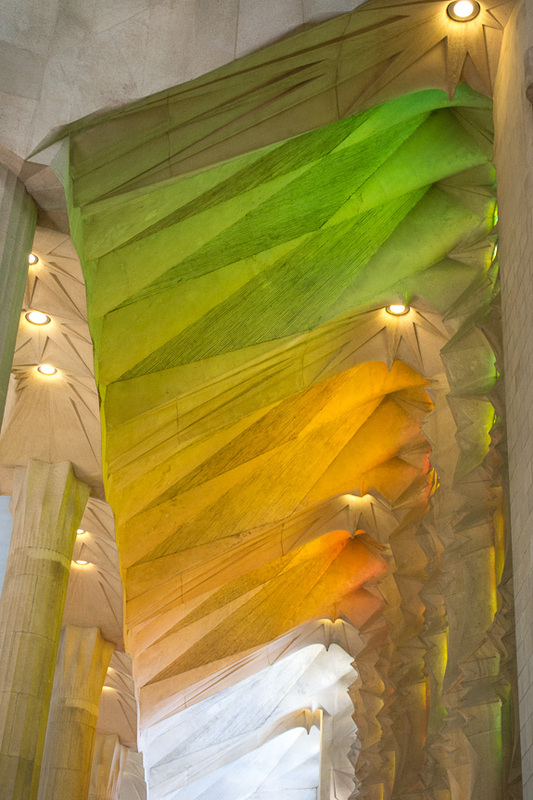 But if I were to try to describe it to anyone I’d say it was a cathedral of light and color. It is truly one of the most ethereal spaces that I have ever experienced. Which is funny because from a distance the outside kind of looks like a hot mess. But don’t be distracted by the cranes and construction. When you get up close and go inside its breathtaking. After admiring the outside the day before we were really excited to actually go inside the next day. With our advanced tickets purchased online the night before (highly recommended) we practically waltzed right in. The interior honestly took my breath away. I couldn’t believe how light and airy it felt compared to the formidable exterior. 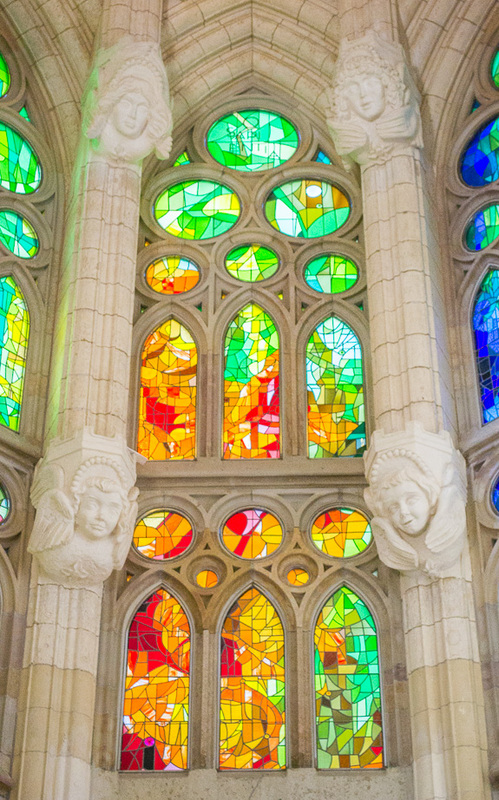 The colors and shapes were so different than anything else I had ever seen in a church. It is a truly mesmerizing space and really these photos are just a tiny glimpse of what’s inside. 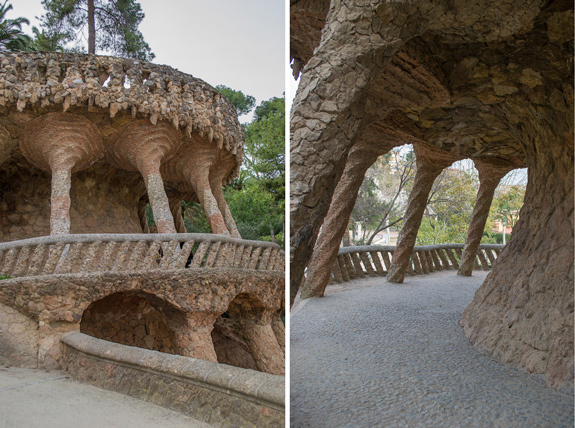 Parc Güell wasn’t actually intended to be a park. 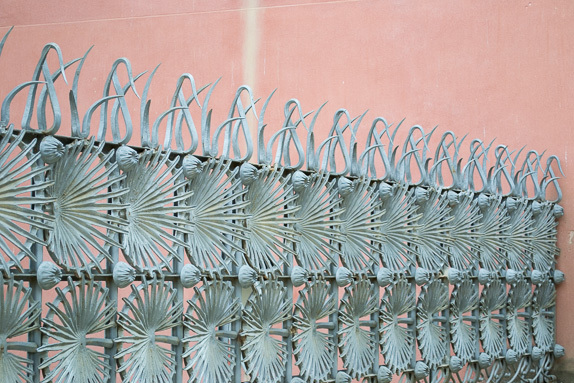 It was originally conceived as a posh subdivision in the Gracia neighborhood of Barcelona but finances got in the way. Which is lucky for the rest of us because it is much too beautiful to not be enjoyed by all. 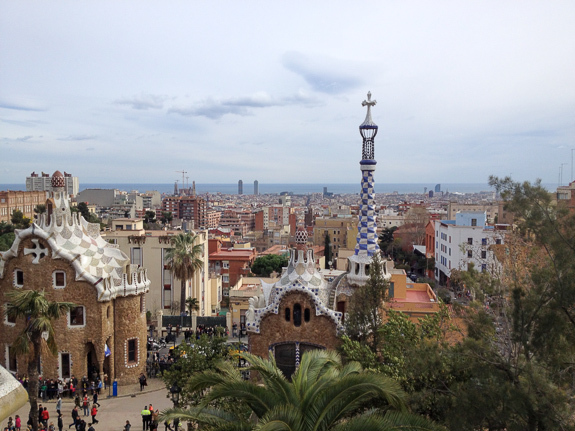 After a very long and uphill walk to Parc Güell we were rewarded with breathtaking views of Barcelona. Walking all the way to the park with 25lb. stroller and 33lb. toddler is probably not something I would do again. Tip: Take public transportation unless you really like walking. All that walking made us mighty thirsty. 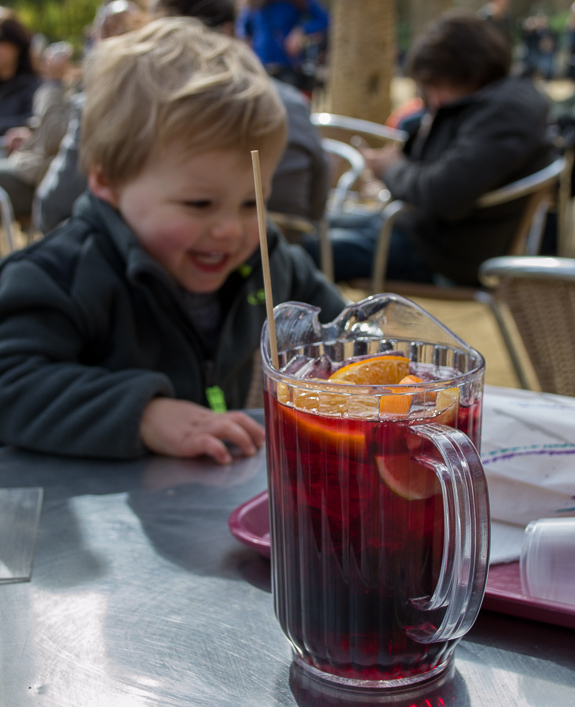 So we had to get a mini pitcher of sangria. It wasn’t that good, but that’s not the point. 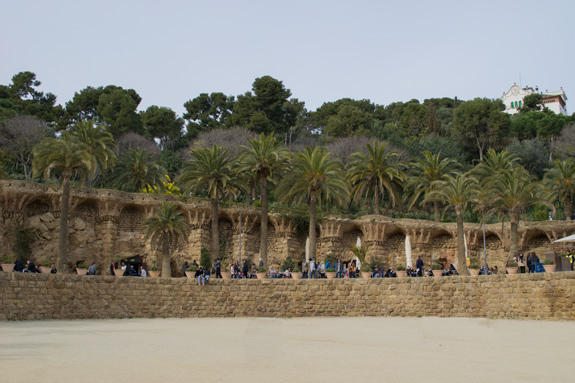 Looking north from the terrace at Park Güell, where you can have a sangria under the palm trees! Don’t you just love seeing palm trees in February. It’s like an instant mood booster. And this is what’s below you, supporting the terrace! The whole park almost feels like it’s been carved out of the hillside. 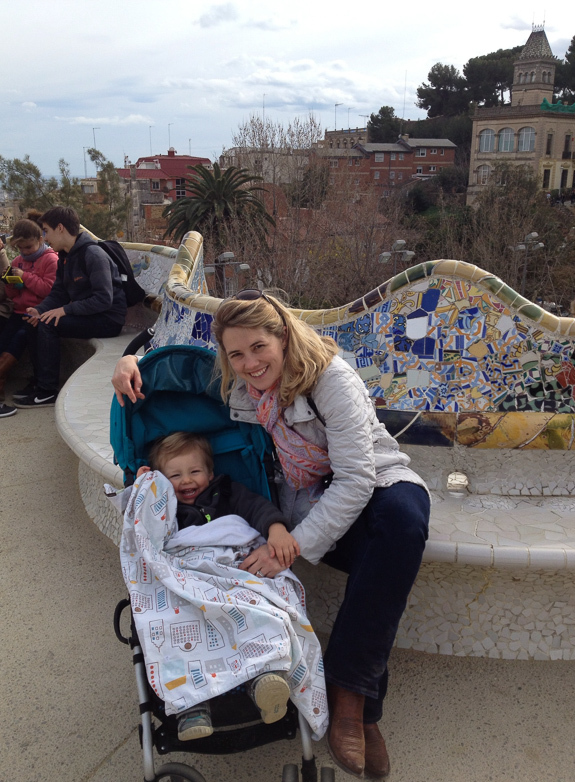 Henry thought Parc Guell was pretty great too! 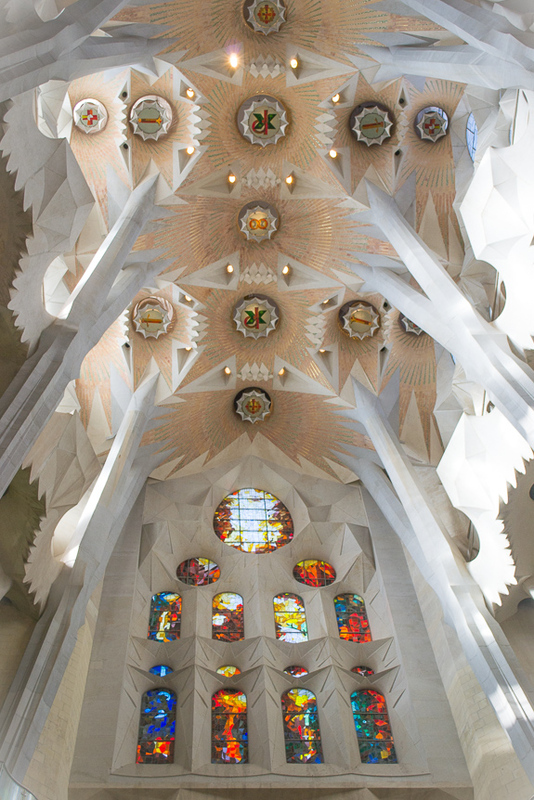 Beautiful photos inside the cathedral! I can see why you love Barcelona.